If you have just been diagnosed celiac one of the first things you will have to do is sort out your kitchen. It can be cathartic, making a clean sweep and creating a space where you can cook food that is going to be safe for you to eat. I like to think of it as a decontamination process, it sounds more dramatic than just having a Spring Clean. It can be intimidating, trying to figure out where to start and even more so if you share this kitchen with other people who aren’t celiac. Whether you share with a spouse, partner, room-mate or children you will need to explain to them what celiac is and how integral eating gluten free and being able to prepare food in a gluten free environment is to your health. If they are reasonable human beings they will want you to be well and will therefore work with you. If not you should raise a haughty eyebrow and throw some science in their direction, tell them this isn’t a fad you are indulging it is a medical necessity. The ideal scenario is that everyone would eat gluten free but this is not a reasonable expectation in most households. If you are sharing a space ask for a cupboard of your own or ask if one cupboard can be assigned to gluten containing food with everywhere else being gluten free. The next step is to start dividing food stuffs into two piles, GF and non GF, the non GF stuff goes in it’s assigned space (or the bin) and the GF stuff is put to one side while you clean. Go by the food lists given to you by your gastroenterologist or dietician. Read the labels carefully and if there are ingredients you aren’t sure of check the internet or call your dietician. The Celiac Society of Ireland is a great resource and regularly updates it’s GF food list. While everyday housekeeping is not something I get excited about there is something deeply satisfying about a good proper clear out. Put on some music , much to my boyfriends disdain I find Muse to be excellent cleaning music, find some clothes that you don’t mind getting wrecked and throw on the rubber gloves. First thing, get all your tea towels and dish cloths and put them in the wash. Throw out your dish sponge, brush or what ever it is you use to wash the dishes, if there was gluten on the plate it washed there is most likely gluten on the sponge. If you have a dishwasher load it to wash all your plates, cups, cutlery and whatever dishwasher friendly pots and baking utensils you have. If you don’t then fill the sink with hot water and get scrubbing. If you have baking tins that you can’t get pristinely clean then either assign them to non GF baking only, give them away or bin them. Clean out your cupboards, if you can get a hoover in there than use the nozzle and get in to the corners, be as thorough as you can. 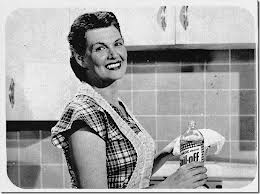 Then wash them out, I am a fan of using baking (bread) soda and distilled white vinegar to clean, it is not toxic, child and pet friendly,effective and cheap. Sprinkle the surface with baking soda and spray on the distilled vinegar, there will be a chemical reaction and the mix will froth a bit, this is great for breaking down grease. The baking soda will act as an exfoliant while you are scrubbing and will get the surface really clean. Rinse out your cloth and wipe down the shelves, do this a few times until you are happy that every last crumb is gone and then use some kitchen paper to dry the cupboard. If you have very expensive, high end work tops and cupboards you should use cleaning products suitable for those surfaces. Repeat this process in your fridge, microwave and on your work tops and cooker. Scrub your hob, grill and oven shelves. As you are on a roll you should clean the interior of your oven using the oven cleaner of your choice. If you have a toaster then bid it a fond farewell, you will never get all the crumbs out. Do not think it is ok to keep on using the toaster for GF and non GF bread, even if you have a four slice toaster where you have designated one half GF and the other non GF, crumbs will travel. You could use toaster bags, I find them fiddly and prefer to use the grill but I do know people who swear by them, particularly if they are making toast in an office kitchen that does not have a dedicated GF toaster. Invest in two pasta colanders, it will make your life easier . If you bake then invest in a new sieve and baking tins. I haven’t baked with non GF flour since I was diagnosed as flour makes dust which can be inhaled so everything I bake with is GF. Invest in storage jars and containers. I have a fine collection of large glass pickle and sauerkraut jars that I have cleaned out and use to store flour, sugar, open bags of dried pasta, rice, herbs, gelatin etc. If you have a shared space this is a good way of avoiding cross contamination. Don’t share butter or dairy spreads, if you use a spread buy a separate tub for your use only. If you listen your better angels and use lovely, salty butter then invest in two butter dishes, one for you and one for non GF use. This rule applies to pretty much anything you would use a knife or spoon to get at, jam, mustard, relish, peanut butter etc. Squeeze bottles of mayonnaise and tomato sauce are excellent for shared use. Wipe down work surfaces before you prepare food just in case. If you are sharing the grill and don’t feel like washing it between cooking non GF and GF sausages or meting cheese on GF and non GF toast then tin foil is your friend, I go through a lot of tinfoil. Use common sense and be vigilant, this vigilance will become second nature before you know it and being careful won’t seem like an effort. Love the tips!! I thought you did a great job hitting all the top points for a new celiac. I honestly can’t remember all the cleaning I did anymore! Thanks! I just had to relieve the experience as my nephew was recently diagnosed celiac.